Treat a couple to a unique gift. 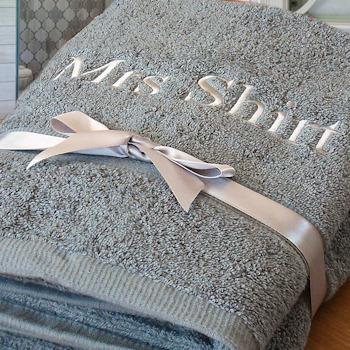 Popular for wedding or anniversary gifts and even a great housewarming gift. Treat a couple to a unique gift. Popular for wedding or anniversary gifts and even a great housewarming gift. These bath sized towels are soft cotton. Personalised with your choice of names, nicknames, titles or embroidered in a thread colour and font style of your choice.